Very nicely finished, light and spacious furnished house of approximately 155 m2, located in a car-free and child-friendly neighborhood. 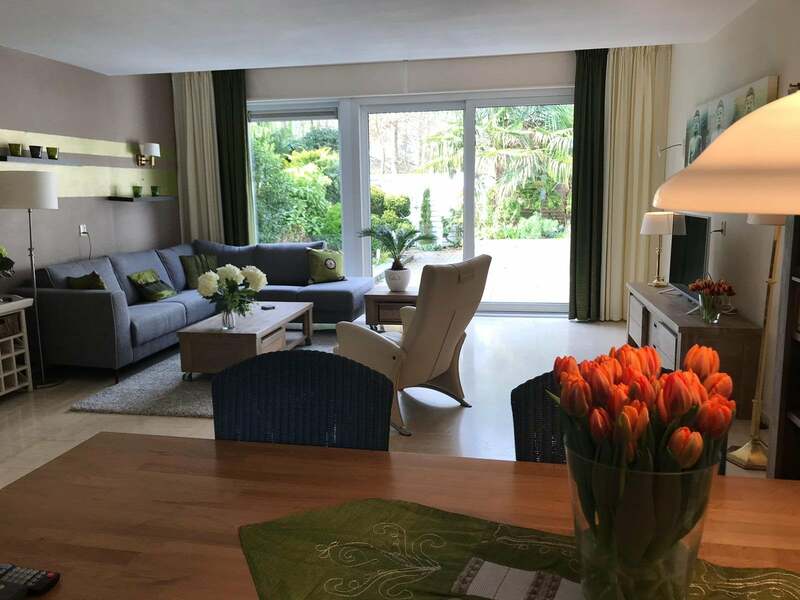 The property is located within walking distance of local shopping center Waardhuizen and there is plenty of free parking in the street and nearby area. From the back of the house you have a view of a municipal park, which is also easily accessible from the gate in the back garden. Layout ground floor: entrance, spacious and light expanded hall with wardrobe; access to spacious and bright (also extended) living / dining room with Travertin tiled floor with underfloor heating and working fireplace. From the dining area you have access to the modern open kitchen of high quality, equipped with Siemens appliances such as 5-burner gas stove, oven / microwave combination, dishwasher, fridge / freezer, extractor hood and black hard stone counter top, as well as a Quooker water tap (instant boiling water). The kitchen is also equipped with sufficient cupboard space, including twice a pull-out carousel and a pharmacy cupboard. The living room gives access to the beautifully landscaped and well-kept back garden with, among other things, 2 palm trees, various beautiful plants and shrubs, built-in lighting and two terraces (morning and afternoon / evening sun)! Spacious stone storagte at the rear with electricity and sink, and outside storage for the firewood. Layout 1st floor (both stairs and landing on 1st floor with new gray carpet): extended master bedroom (formerly 2 rooms), with large fitted wardrobe and built-in dressing table, large double bed and laminate flooring. There is also an (analogue) TV on the wall here. The second spacious bedroom has a French bed (smaller double bed) and laminate flooring; neat spacious bathroom with shower cabin, 2nd toilet, sink with built-in storage cabinet, design radiator and window for light and fresh air. Layout 2nd floor: landing, large bedroom / guest room with double bed, sofa bed, desk, closet space and heating system in cupboard. This room also has laminate flooring and through sliding doors access to spacious and sunny roof terrace (evening sun, West) with a view of greenery in the area. The sliding doors are equipped with shutters for safety and as blackout curtains. From this room you also have access to the neat laundry area with washing machine and dryer. Wonderfully spacious and beautifully finished family home in a nice, green and child-friendly neighborhood!